It all started with the creak of an opening door on a rusty hinge and the sound of shuffling feet making their way ever closer. What caused the outbreak wasn’t clear, but seemingly out of nowhere, the dead were rising from the grave, the morgue, or out on the streets, and walking again amongst the living. But something had changed. These weren’t the same people they had been in life. These creatures were single-minded, vicious, hungry, and their desires had evolved since their days among the living. Now, the only thing that would satisfy their cravings was human flesh. The Survivors of this infection had no choice but to band together, grab anything close by to use as a weapon, and fight for their lives. So began one of the most epic and long-running series in board game history. Zombicide has been thrusting players into countless battles for survival over a number of sequels, expansions, and time periods. For this week’s CMON Feature Friday, we’re taking a look back at Zombicide, the franchise that started it all. Zombicide: Season One was first published in 2012 after a successful Kickstarter campaign. The adventure was set in modern times, and players took on the role of Survivors like Wanda, a chainsaw-wielding waitress on roller skates, Phil, a small town cop just trying to make it home to his family, Amy, a katana-swinging punk rocker, or Doug, an office worker that had been pushed one step too far. Working together, the Survivors fought their way through ten different challenging scenarios. To live, they were forced to scrounge for weapons, using anything from shotguns and pistols to frying pans and baseball bats. In Zombicide, we were introduced to different classes of walking corpses that would become familiar to fans of the series. The Walker was the standard zombie, stumbling forward, thinking only of their desire for flesh. Walkers were slow and easy to kill, but what they lacked in danger, they make up for in sheer numbers. Gangs of them would close the gap between Survivors, forcing players to take more risks and make mistakes, until it would be one too many and they’d be swallowed by a sea of rotting flesh and teeth. Fatties were tough, really tough. Bloated, big, and nasty, a Fatty could only be taken down by a weapon that did two damage. Anything less bounced off them harmlessly. They’d just laugh those attacks off… or, they would have if they still had a lower jaw. Runners were the zombies that could really make your palms sweat. They moved with a frantic speed, foreign to the other dead. Maybe they had expired more recently, or maybe their bloodlust was stronger. Who really knows why? The only obvious thing about the Runners was that they were hard to hit. Rounding out the rotting foes you might have found yourself face-to-face with was the Abomination. These giant monstrosities were not just huge, they were mutated, barely resembling the human being they once were. Killing them took a weapon that dealt three damage, like, say, a Molotov cocktail. Zombicide: Season One kicked off the series and was one of the most popular board games of the year, but it was only the beginning. The success of Zombicide spawned a sequel the following year. Zombicide: Prison Outbreak traded the openness of city streets for the tight confines of a prison. Six new Survivors were introduced, and players had to convert their place of confinement into a zombie-free sanctuary. Prison Outbreak also introduced the Berserker Zombie. This new breed of infected walking dead was immune to ranged attacks, meaning that combat was reduced to melee. If you thought these corpses smelled bad at a distance, it was much worse when you got up close and personal. Luckily, a prison was a good place to find weapons and new gear like riot shields and concrete saws made the dirty work of cutting down zombies a little easier. Prison Outbreak included 10 new missions for the Survivors to fight through. Would they be able to live through the nightmare? And what would be left of the world if they did? Those questions were answered in Season Three of the modern series, Zombicide: Rue Morgue, published in 2015. By the time of Rue Morgue, the zombie apocalypse had been raging for a while. Society had fallen, and it was survival of the fittest. This installment of the franchise took place on abandoned city streets and within one of the most dangerous places to be when the dead are rising, a hospital. Resources were limited and Rue Morgue allowed players to break off into teams and fight competitively over supplies. Every good zombie movie involves humans turning on each other. For the first time in the Zombicide series, players were offered the chance to look out for their own best interests. Just as the rules for survival had evolved with the passage of time, so too had the zombies. Skinner Zombies were introduced. These mindless killers had the will to continue ‘living’ this long, so you know they wouldn’t go down easy. If players rolled a One in an attack against Skinners, they would be replaced by Crawlers, legless creatures that continue to pursue the humans until being defeated again. Everything got bigger in Rue Morgue, from the A-Bomb Abominations, to the gigantic maps, to the 14 challenging scenarios, themselves. The modern Zombicide timeline is full of incredible adventures, tough decisions, and a whole lot of zombie-killing action. Aside from the three core boxes, there is a huge amount of additional content. The Toxic City Mall expansion introduces new Survivors, as well as Toxic Zombies that spray blood and inflict damage when they’re attacked. As George A. Romero fans know, no zombie uprising is complete without a trip to the mall. There’s also the Angry Neighbors expansion, which adds Companion characters and the Seeker Zombies that get extra activations each time a new one is added to the board. We haven’t even mentioned the Special Guest Artist boxes containing Survivor figures based on the work of some of the best artists in the world today, or the number of other supplemental boxes with new Survivors, Companions, and, of course, Zombies. 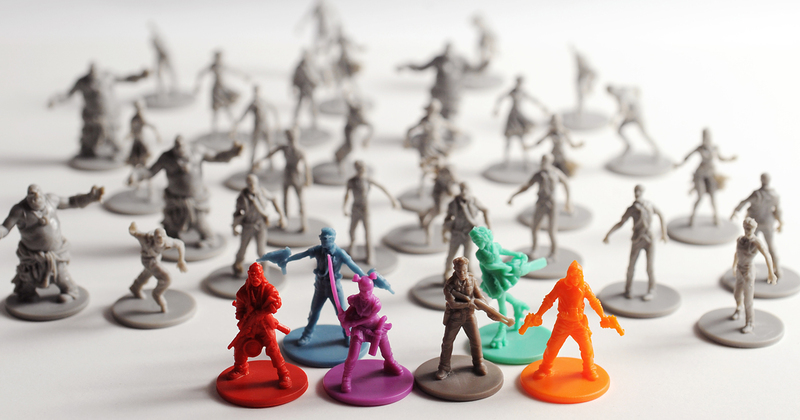 Suffice to say there is a lot to sink your teeth into in the Zombicide world. After three successful Kickstarters and a loyal fan base, the story of the dead getting up from their graves and hunting the living was about to take a dramatic change in tone, scenery, and style. In 2015, we traveled back to the days of old, to once more face off against the undead hordes. We’ll take a look at the medieval storyline in the Zombicide universe in Part Two of our Zombicide Retrospective. Stay Tuned!